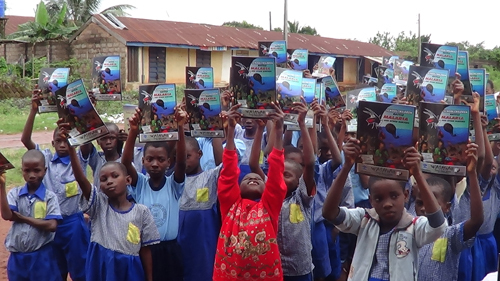 The BFI team of media and development specialists in collaboration with Horizon International is currently offering WASH (Water, Sanitation, and Hygiene) education outreach materials to schools in flood-prone areas of the country as an intervention. 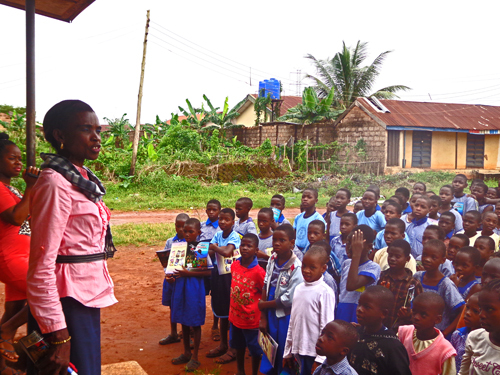 Working together with local educators, the media service of BFI is currently visiting schools in selected communities in Edo State where they engage with schoolchildren on health and wellness education. They are distributing for free WASH4All comic books and other info-graphics aimed at teaching schoolchildren the importance of clean water, good hygiene, and improved sanitation practices that will ultimately reduce the prevalence of water-borne childhood illnesses. This effort is made possible with additional support of a seed grant from The Pollination Project (TPP) and the support of individual friends of BFI. The flooding situation at the Evbuotubu Primary School has entered its 19th year as community sources say. Year after year the schoolchildren learn in the conditions of a mosquito-infested environment. Their entire school premises have been overtaken by flood and bushes. The school buildings are gradually submerged in flood water. They have no access to drinking water, no functional latrine. 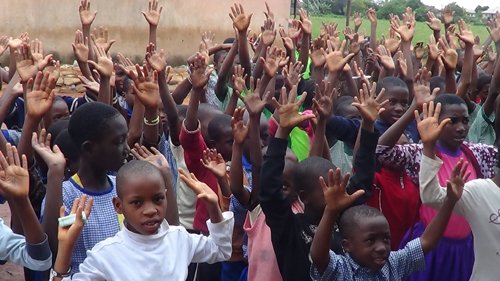 The negative impact of the WASH situation on the health, psychology, self-esteem of these children at Evbuotubu primary school, and indeed the overall intellectual development and academic output and effectiveness of both teachers and pupils has remained a source of concern to many child development advocates. Background stories on the Evbuotubu Primary School flooding problems and environmental challenges in the community can be accessed online at: www.solutions-site.org/node/832; http://www.globalfreepress.org/departments/features/3956-the-evbuotubu-crisis. 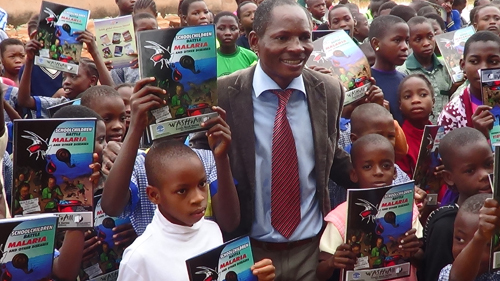 The special comic book, WASH4All comics, 1st of a planned 13 editions in the series, is titled “Schoolchildren Battle Malaria and other Diseases.” It has been offered for free download worldwide since September 16, 2014, by Horizon International and MediaBFI. 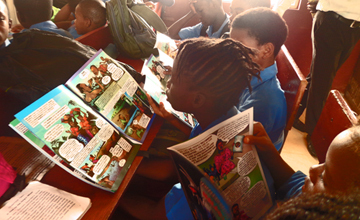 However, because most of the real targets of the comics are grassroots schoolchildren who don’t have access to the internet, it became necessary to make print copies of the comics available for free to these sets of audiences in selected local schools where WASH need is among the highest anywhere in the world, especially in Sub-Saharan Africa. · How to be responsible for your health and wellness. Student reads WASH4All comicAs of January 2017, the BFI WASH in Schools (BFI WinS) project has successfully fostered educative dialogue between the organizers and many schoolchildren, enlightened many children and answered some major questions they have about WASH, puberty/sexuality and other related health issues affecting young people in Nigeria – all within the prism of “edutainment” and graphic humor. The WinS project has also enabled the organizers to interface with teachers, school heads and other relevant authorities and stakeholders, some of whom shed lights on how to make the project succeed better and how to make more impact in a sustainable way. THANKS TO THE SPONSORS! 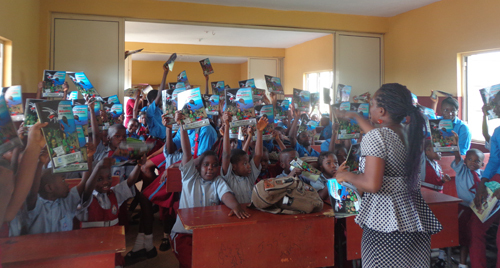 A cross section of Evbuotubu Primary School pupils (as well as their Ugiagbe counterparts, not shown here) flaunting their free WASH4All comics at the event. VOTE OF THANKS: The Headmistress of Ugiagbe Primary School, Evbuotubu, on behalf of her school and the Evbuotubu Primary School head, staff and pupils, appreciates the humanitarian efforts and benevolence of the BFI team, after the exercise on Friday, October 14, 2016, marking the world Hand Washing Day. This article and photographs are by Francis U. Odupute, Founder and head of BFI. It was published by Horizon International on 2 January 2017.